My name is Jonathan Crownie, and this the story of how my brother Freddie… changed. 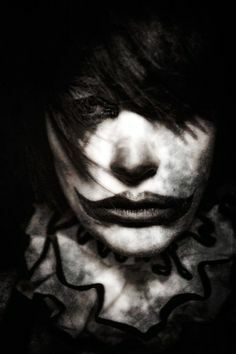 He was alway sad, nothing really cheered him up people even call him Frowne, but only one thing ever made a smile on his gray sad face and that was clowns. “Hey Fred time for school so wake up.” I called as I walked in his room. He wasn’t there but this is typical of him. He came up from the basement with tears in his eyes. “Huh… nothing.”he said as he grabbed his bag and walked out to the bus. Dad came from the basement, without saying a word to me. “Bye dad.” I said he answered by waving back. I hurried out the door to get on the bus. When I got on kids were shoving my brother back and forth saying” Hey Frowne what’s wrong you crybaby.” This is typical to he just stood there taking all of their bullying. “Leave him alone.” I shout at them they quickly quit. I’m quite muscular so I kinda scare people. As the school day end a search for my brother on the bus, he’s in the back as usually when he turns to face me I see his face was beat up and a huge frown was drawled on it. “Oh god Fred what happened to you? Who did it?” I quickly asked. “But I am worried about it…” I was saying before he just sighed and I knew I couldn’t help him, but dad can. When we rush home dad instantly sees freds face and takes him to the basement, I could see dad has been drinking. I sneak down the stairs to see whats going on and and dad was beating Fred. “You worthless pice of S**t, I don’t know why we even adopted you. All you do is bring shame to this family how may times am I going to have to do this.” He shouted at Fred he’s adopted I see how he’s the only one with black hair. But this is no way for him to treat my brother like that. “Dad what are you doing?” I stammered Dad jumps in shock, f**k he says under his breath he grabs his long knife from his pocket and rushes toward me. I’m frozen in shock as the blade cuts strait through my skin. All I can see now is Fred grabbing a long pole that has dry blood on it and reputedly bashing in our father’s head. It kinda looks like he was smiling the world went black. (Switched to Fred.) The blood was all over my body but I was glad. I grabbed the knife and stuck it in my mouth and cut a long sad face one my mouth. As Johns mom arrives home she secretly comes down to the basement. I grab my pole they usually beat me with both him and her. I swing it as hard as I could at her head CRACK was the only sound I heard. I walk out the basement door and turn to see the TV as the News man says” The teenage boy that was caught a few weeks back for countless murders has somehow escaped, If you see this boy run.” A picture of a blonde hair boy with his left eye missing with a huge grin named Ari Asylum. He needs to quit smiling I say to myself. That was stupid af, that’s just some stupid a*s remake of Jeff the killer. Not good. Very poorly written, so many spelling, grammar and wrong tense changes. Whole sentences did not make sense. The story was not well thought out, and was not presented in a legible format to readers. I apologise for my harsh criticism, but it really wasn’t readable. Don’t bash so hard maybe this is his first attempt what if this was you writing. Try to be nicer. Thank you very much for your comment. I thought I had provided calm, unbiased, truthful criticism , and as it was unfortunately harsh, I also apologised, as you say. I most certainly was not “bashing” and certainly not “hard”, again as you say. So lovely that my comment was properly read and properly understood. Thank you again.